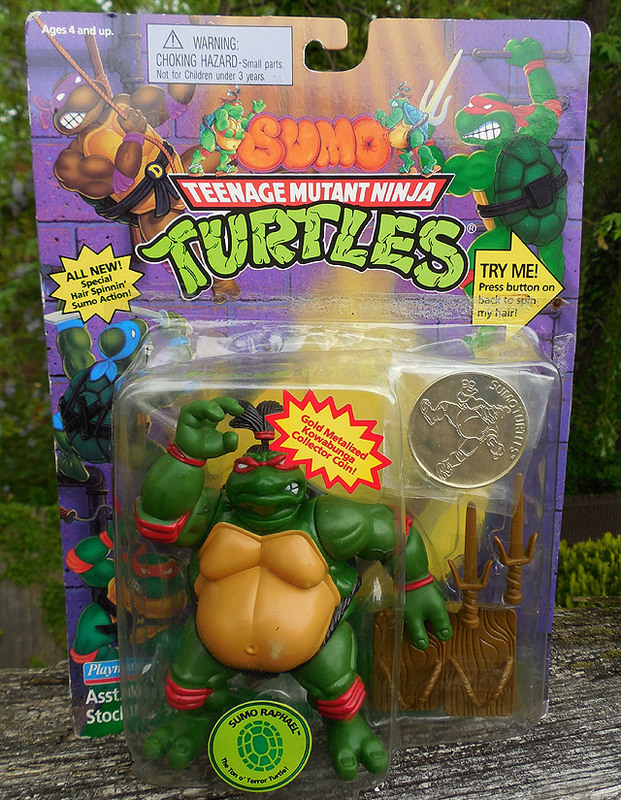 Ninja Turtles "Sumo Raphael" Figure! | Dinosaur Dracula! 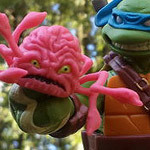 Playmates’ original collection of Ninja Turtles toys survived for longer than you might’ve noticed, because if you’re around my age, you probably outgrew five-inch Donatellos before the rest of the world did. It’s a shame, because as the line entered its final years, Playmates made some desperate but creative attempts to keep those Turtles afloat. Objectively speaking, many of the collection’s best figures came out near the end. 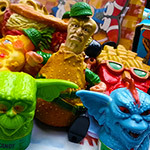 Believe it or not, this existed! 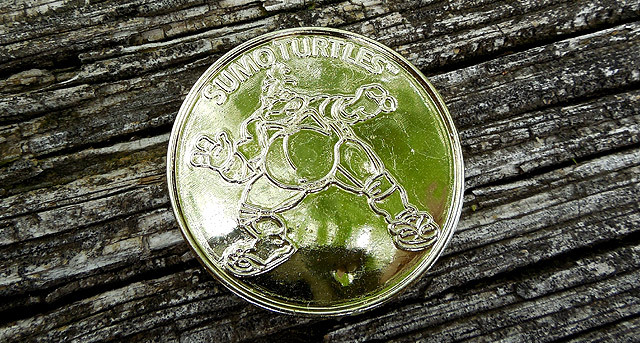 “Sumo Raphael,” released in 1995, was just one of the seemingly countless revamps to the main Turtles, who by that point had been everything from astronauts to cowboys to Universal Monsters. 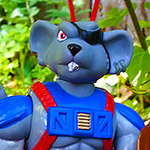 I always preferred unique characters to the endless Ninja Turtle revisions, but when they worked, they really worked. 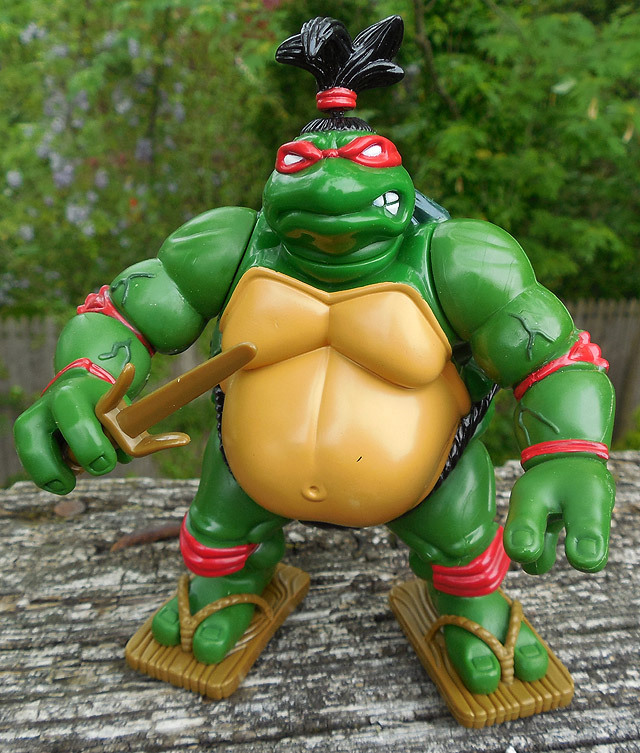 And a big-bellied Raphael with Yokozuna’s hair? Yeah, that really worked. But the size is just the start of it. Every detail is top notch. From the veiny muscles to the thickened thighs, it looks more like a small statue than an action figure. 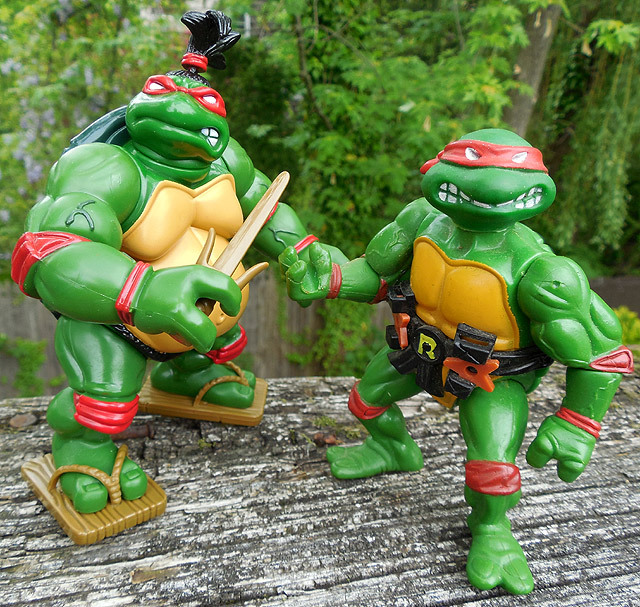 Still, the usual articulation is there, and Sumo Raph can move his arms, legs and head just as easily as Not Sumo Raph. His big gut is the best part. Playmates didn’t just “hint” at it. Raph’s stomach is REALLY pronounced. Counting the moobs, his torso looks like a big gorilla head. 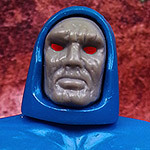 The figure would’ve been worth buying even without the sandals, but Playmates just kept going with the awesomeness. 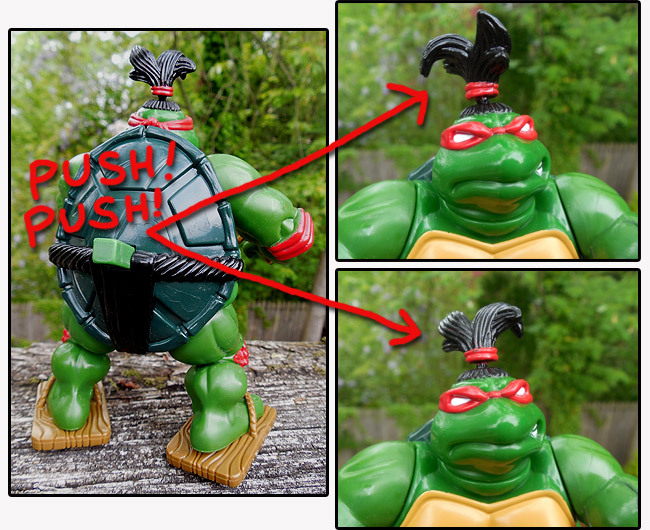 A button on Sumo Raph’s back makes his hair rotate, which is just about the strangest feature an action figure could ever have. 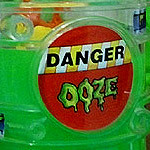 I appreciate the extra oomph, but I can’t help but wonder what was going through Playmates’ heads. Supervisor: He’s almost there, but can we make the hair spin in circles? Artist Guy: Huh? Why would his hair do that? Supervisor: WIND, you fucker. W-I-N-D.
Good Christ, and I thought I was bad with the superfluous adjectives. 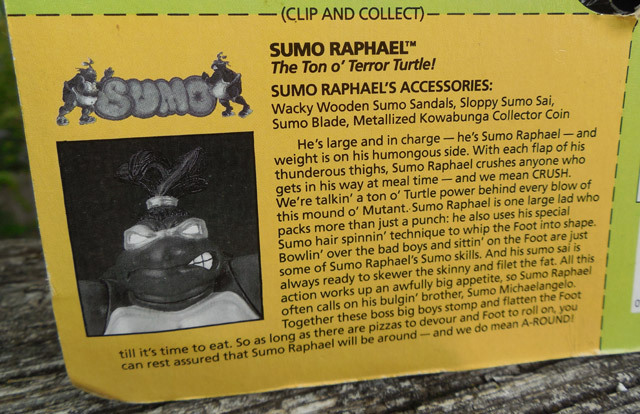 Summarizing the thousand words they somehow crammed into Sumo Raph’s cutout biography, his hobbies include eating and beating up the Foot Clan. 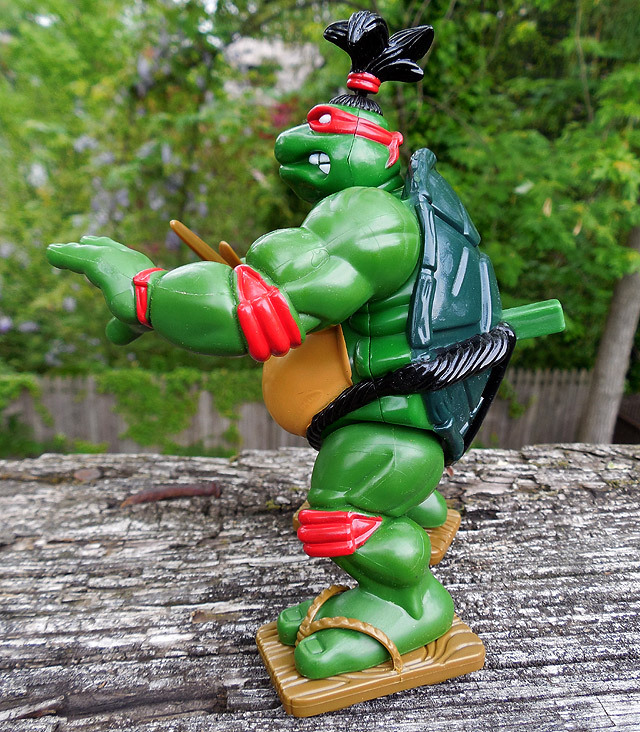 I’d never even heard of Sumo Raphael until a few years ago, which inspired a closer inspection of the many other Ninja Turtles figures I missed out on. If you’ve never looked into the tail end of the collection, I strongly suggest that you do so. 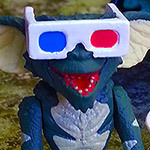 To whet your appetite, there was everything from “Robotic Bebop” to a mutant monkey named “Sergeant Bananas.” These aren’t things you can afford to ignore! 8 out of 10. 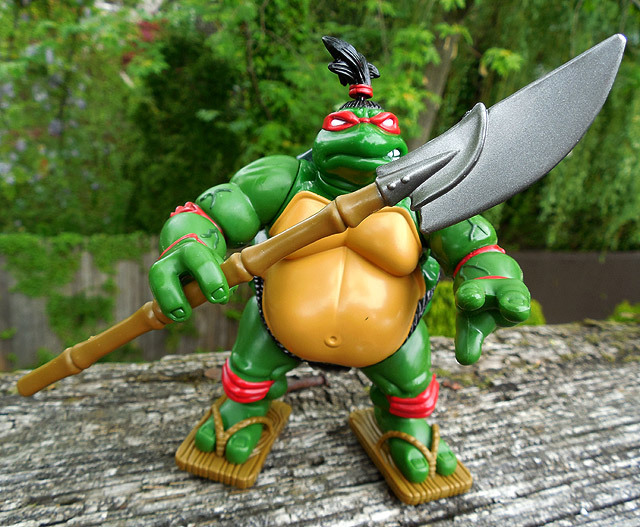 I’m not testing this, but I think Sumo Raph would survive a fast pitch into concrete. 8 out of 10. When Sumo Raph lifts his left arm, he looks like he’s only narrowly failing to do the Vulcan salute. 8 out of 10. Sumo Raph’s skin is a pleasant shade of green. Like grass, but really healthy grass. 0 out of 10. Sumo Raph cannot do this. So, 24 out of 40, but with 10 bonus points for the sandals. 34 out of 40. At worst, that’s an A-.